Jon Stewart Says Bill O'Reilly Is Papabili! As he so often reminds us, Bill O'Reilly is a devout Catholic who is on a one man crusade (or is it jihad) against those evil secularists, dirty women, and truly satanic LGBT types who are all trying to tear down Bill's traditionalist America and his beloved church. As he so often reminds us, he is "looking out for us." But while he does command quite an audience, not everybody has access to his pontifications. He really needs to go from Fox News urbi to global orbi. 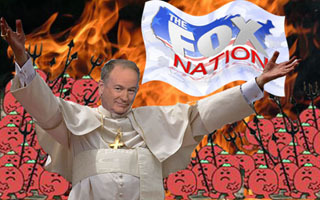 So who better to don those papal Pradas and exchange his Fox crown for a papal mitre than TV's own Bill O'Reilly?! Jon Stewart certainly recognizes the papal possibilities for the very "papabili" PapaBilly O'Reilly who, as Stewart astutely notes, already thinks he's infallible! And if he's not papabili, I think it's safe to say he's papabully. I am going to be everyone’s favourite write-in candidate for Pope. Thinks he’s infallible, hates women, thinks that society should be segregated, and will excuse any crime committed by the religious fringe. I think Stewart’s onto something here. the only person o’reilly is looking out for is himself. I have been calling for this for months. POPE BILL OF ILL WILL. He will be a natural. Being President Of The United States, just doesn’t offer enough EGO and CONTROL to suit our Bellowing Billow. Since Billy has appointed himself as “protector of children”, Head of the Catholic Church is where he should be.